In a hospital that would not / did not help Amanda in those first critical two hours of her life? It has taken 34 years – They hushed it up – they withheld the truth. Only a few months ago in 2013, I found the truth as to why my baby daughter died. Oh, God, writing this is hard! As I type, the tears are rolling down my cheeks and my heart aches, still in disbelief. I have, to this day, never discussed the loss of my baby Amanda with anyone at all, because I had got no answers or information from my GP, the midwife involved, or the hospitals. For 34 years I have kept this inside, and writing it down now – is agonizing. I now have all the birth notes, from both hospitals. Plus all I saw and heard in the labour room and delivery room, through to transfer from Burwood Hospital to Christchurch Women’s Hospital, to my three day stay – and beyond – when I visited each staff member in turn, with questions, and how they responded to my visits. The last thing my General Practitioner said to me was – “You are doing fine – I don’t need to see you so often any more” – big mistake! He should have been seeing me more often in the last 4 weeks -”I’ll see you in delivery!” – I chose this doctor because he was such a well respected Christchurch GP, and had a wonderful doctor/patient manner. But the man with whom I spent the last seven months as his pregnant patient, did not even turn up to monitor my stages of labour or the birth. I approached him several days after I left the hospital, and asked why he did not come to delivery? His answer was: “I was busy!” It was his responsibility to monitor and oversee the stages labour and delivery. He let us down in the worst way possible. Because my GP did not arrive at all, a midwife whom I did not know proceeded to watch me in labour. I did not want a midwife for the birth – that is why I chose a General Practitioner. I chose and wanted a doctor. Just before Amanda’s birth, the labour room became a room of total chaos. Another midwife arrived and they began shouting at each other about the fact that meconium was in sight and to move me to the delivery room immediately. The midwives had plenty of warning that thick meconium was present and this called for urgency, including calling for help from Paediatricians and other doctors in the hospital. They did not call anyone to help. One midwife left altogether, and only one midwife remained with myself and Amanda. Amanda was born at 5.55am on Saturday 15 December. The midwife spent a total of seven minutes trying to resuscitate Amanda, performing the wrong procedures, and eliminating the most important of the required procedures, Trachael Intubation – the clearing of Amanda’s throat of thick meconium before it reaches her lungs. Amanda was non-vigorous and not breathing when she was born. All the signs of were right there in front of her that Amanda required intubation – immediately – and she did not/would not do it. If she could not do it, it was her responsibility to get someone who could. 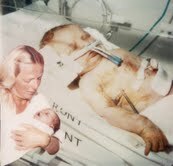 It was now that the midwife shouted out loud – “It’s not working, oh my God, I don’t know what to do!” She ran out of the room yelling – “I need a doctor, I have to find a doctor!” My God – she should have been yelling for doctors as soon as she saw thick meconium and before Amanda was even born!! She had decided to do other than the required intubation. She was away for some time and she eventually ran back into the delivery room, shouting “I can’t find a doctor anywhere, why can’t I find a doctor, where are all the doctors?” There were women in the hospital having babies and there isn’t a doctor??? She put Amanda into a cold cot and pushed the cot next to the wall. Then she left. This is how Amanda became extremely cold and her temperature went down from 36 degrees to 34.5 degrees. Like this, we waited for over an hour. A few days after I was released from the Hospital I went back to see this midwife. I knew her name from the hospital forms and I asked for her. She came to the door-way of the reception area and I asked her if we could talk. She said to me, “If I talk to you, I will lose my job!” With that she retreated, shut the door, and left me standing in the foyer of the hospital reception area. So we waited, and waited….for what? – I did not know. No-one came in to tell me anything, or tell me what was happening, or what would be happening, or why it was happening. I could see that my baby was “blue” and lying still – she wasn’t crying. Born at 5.55am, midwife performed the wrong procedures on Amanda for seven whole minutes. That’s why – quote – “it wasn’t working”. The midwife ran around hospital trying to find the elusive doctors. Pushed baby against the wall. Amanda was left with no help or attention for over one hour. Ambulance Transfer from Burwood to Chch.Womens 48 minutes. Arriving at Christchurch Womens Hospital at 7.50am. 10 minutes to arrive at the Intensive Care Unit at 8.00am. (I am following Birth Notes here). Now it is two full hours after Amanda’s birth. Amanda is “blue/purple”. She is very cold. Amanda was born at 36 degrees and now her temperature had fallen to only 34.5 degrees – Neonatal hypothermia. Amanda was taken directly to ICU, and I was taken to a normal ward where three other mothers and their babies were. Time passed and no nurse, no doctor, or medical staff came to see me, or tell me any information. Ten o’clock came and went. Twelve O’clock came and went. I called a nurse and asked “Where is my baby?”……She said “Hasn’t anyone told you how sick your baby is?” I said “No – where is she?” The Nurse just looked at me and left. I thought she would come back. She did not come back. Nor did she give me any answers. No-one would tell me where she was, or how she was, and no-one told me I could go and be with her. Communication in the hospital was zero! At two o’clock (2 pm) in the afternoon of Saturday 15 December, I was asked if I would like a room on my own. “Why? – no thank you, I like having the other mothers for company” I replied. And regardless of my reply, without an explanation, they moved me to a single room by myself. This is the way they communicate….or not! The next thing I knew I was put into a wheel-chair and taken into a very small, white, clinical, cold room with nothing in it but a single chair. With no warning or communication of any kind, a doctor carrying a baby came into the room, said “Your baby didn’t make it – you might like to hold her while we take a photo of you both.” As soon as I heard the “click” of the camera, he said “We have to take the baby now and put her on ice for the post-mortem”. In the flash of a moment, she was given to me and snatched away. It happened all so quickly – I didn’t even speak, or catch my breath. I couldn’t believe what had just happened! What post-mortem? What are you talking about? “Oh, we are doing a post-mortem – sign here”. I said – “What!…..NO!” Just as I couldn’t believe what was being said, neither were they pleased with my reply. Nothing about post-mortems was explained to me. Communication again was nil. It was just “sign here!” and to this very day, if any-one tells me to “Sign here!” my answer is always “NO” NEVER! The photo you see above is the photo taken with a “click” of the camera before they snatched her away. I did not know that I had the right to hold on to her, for as long as I liked….I know that now….but I didn’t then. I would give anything, anything, to have that moment back. I would have taken her home. Oh, knowledge is a wonderful thing…..if only I had known then….. I was taken back to the single room by myself. None of the doctors who attended Amanda in Intensive Care came to see me. My own GP did not come into my room and talk with me. The following day I was sitting on the side of the bed, my head in my hands, my GP just popped his head around the door-way and said – “I have just found out that your baby didn’t make it….sorry to hear that”. The voice sounded familiar and I looked up – but before I could answer, he was gone! A nurse came in and said, “Oh, that was your GP – you will be able to see him for a check-up after you leave here”. When my baby died, everyone kept their distance. There were no words of comfort, no company, no helpful information given. Nothing. And that is how I was “discharged” to go home. Leaving my own child with people I did not know…to do what they do…and I didn’t know what that was either. My God…AMANDA. How did this happen for you? As soon as I could, I went to see each of the hospital staff that had come in contact with Amanda. A couple of days after this visit my GP wrote me a letter dismissing me from his services as my GP – literally pushing me away so he did not have to deal with my questions. THE FUNERAL: – Thursday 20 December. The “funeral” is a blur. I do not remember it. I was in shock and it did not mean anything to me. I felt nothing, I had no tears, I did not know the people who came with the little white casket that I did not get to choose. And I did not know the person who spoke. I do not remember what was said and I do not remember how I got there or how I got home. I do not remember who was there – if anyone was. The arrangements had all been made without my knowledge or input – and I am extremely angry to this day about that. I did not even get a choice as to where the funeral would be. I would like to have a funeral all over again – my way. Yes, I am angry at the doctor who let us down – in the worst way possible. Yes, I am angry at the midwife who tried to play God, when she had no right to deliver my daughter when she was not qualified to do so – and yes, I am angry at the hospital, for making Amanda and I wait for two hours to receive help for my baby’s life. All hope was gone – before we were even put into the Ambulance. Nothing Christchurch Women’s Hospital did was able to save Amanda. The blame lies squarely with my GP and the Midwife and Burwood Hospital itself. Who turned off Amanda’s – My baby daughters – Life Support without informing me?? Why didn’t someone come and get me…. I was only a few doors down the hall but I didn’t know it. I had asked about her and had asked for her. No one came. She was literally withheld from me. SHE NEEDED ME! If ever there was a time I should have been with her, it was now. She needed to hear my voice, to touch her face, to hold her hand. To tell her to hold on. To tell her I love her. To try and will her to respond. The doctors, the nurses, and the hospital denied my little Baby her rights of sensing her own mummy’s presence. And they denied me, her mother, the most important part of giving birth to my child, that I carried in my tummy – contact with my baby. THE TRUTH! Doctors… THE TRUTH! Hospitals…. THE TRUTH! Midwives… And MIDWIVES – if you do not bother to learn and become proficient in Endotracheal Intubation – STAY AWAY from our children! If you don’t do it right or you make a mistake – SAY SO! I needed to deal with the truth at the time of the birth. I have just been stunned by the whole ordeal. But no – 34 years later I find out exactly what that TRUTH was! I would like to re-visit again the Paediatrician, and tell him – “this time – tell me the truth”. But I can’t….it’s too late… I have found out that the Paediatrician has died. I have his obituary. Again, 15th December is coming around. What do I do with what I know now? How do I stop the tears for my daughter? She couldn’t help herself. She relied on the medical experience and supposedly expertise. How do I ever move on after what they did – and did not do, for Amanda? Her life, stolen. Giving me a “photo” of my little girl with tubes everywhere, is a cold and heartless substitute, for being denied our rights as mother and child to go through this together. It was too late for intubation now….over two hours too late! This is APPALLING. It is a disgrace on the Public Health Maternity System. Nothing compensates for the death of your baby. I AM AMANDA’S MUMMY – AND AMANDA – FOREVER MY DAUGHTER.